This interesting name is of Anglo-Saxon origin, and is a dialectal variant of the locational name Bolton, so called for example: Bolton in Cumbria (near Wigton); in Lancashire (near Urswick); also Bolton in Northumberland, Westmoreland and in the West Riding of Yorkshire. The name, in all cases derives from the Olde English pre 7th Century "bodltun", composed of the element "bodl" or "botl", a dwelling house or hall, plus "tun", an enclose or settlement; hence, "dwelling house or hall in the enclosure". Locational surnames were usually acquired by a local landowner, or by the lord of the manor, and especially by those former inhabitants of a place who had moved to another area, and were thereafter best identified by the name of their birthplace. The surname is first recorded towards the end of the 12th Century (see below). There are two notable namebearers listed in the "Dictionary of National Biography": one Richard Boulton (1697 - 1724), a physician, who published medical works; and one Matthew Boulton (1728 - 1809), an engineer who entered partnership with Watt, who he greatly assisted in the completion of the steam engine. 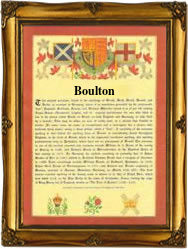 The first recorded spelling of the family name is shown to be that of Robert de Boulton, which was dated 1191, in "Early Yorkshire Charters", during the reign of King Richard 1, known as "Richard the Lionheart", 1189 - 1199. Surnames became necessary when governments introduced personal taxation. In England this was known as Poll Tax. Throughout the centuries, surnames in every country have continued to "develop" often leading to astonishing variants of the original spelling.